Cover artwork: Photograph © Nick White. The effortless counterpoint and rare melodic gift of John Jenkins find peerless voice in the care of masterful viol consort Fretwork. Amateur viol players throughout the world love playing the consort music of John Jenkins, probably more than any other English composer of the great golden era of music for multiple viols, that ranges from William Cornyshe in 1520 through to Henry Purcell in 1680. And the reason why is not hard to fathom: a rare melodic gift is married to an exceptionally deep understanding of harmony and modulation; effortless counterpoint gives each part an equal voice in the musical conversation; and a virtuoso viol player’s knowledge of what is possible, works well and is effective on each of the consort’s viol sizes. We can guess that they must have been quite advanced players in that much of the music was highly virtuosic in the division style, where slow-moving lines are decorated by ‘dividing’ the longer notes into ever shorter ones. 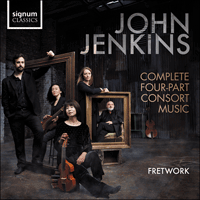 However, the consort style was mostly concerned with more melodic, mellifluous lines and Jenkins wrote a large body of such music for four, five and six viols. The music for four viols comprises seventeen fantasies and two pavans, and calls for one treble viol, two tenors and one bass viol. 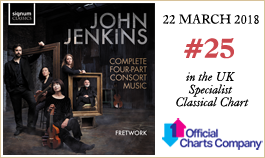 Jenkins was a very long-lived man, and it’s difficult to date his music, though the consensus amongst scholars suggests that this consort music was composed in the earlier part of his life. He was born in the reign of Elizabeth I in 1592 in Maidstone, Kent; and he died in the reign of Charles II in Kimberley, Norfolk in 1678, making him an unusual 86 years when he died. He was ten years senior to William Lawes, with whose music his is often compared; but a greater contrast in life, character and style could not be imagined. Lawes’s life was short, ended violently and was closely connected to the Court and London; whereas Jenkins’s long life ended peacefully, and he stayed away from the Court and the capital. And perhaps we can sense this in their very different styles of music: while Lawes ‘broke somewhat the rules of music’ in his flair and passion, Jenkins mellifluous style was concerned with a smooth perfection, for the most part eschewing drama. The two composers probably knew each other, as both were employed as composers for James Shirley’s prestigious masque mounted by the Inns of Court to demonstrate loyalty to the crown, The Triumph of Peace (performed 1634). His father was a carpenter, and could well have made the seven viols and violins that were listed at this death. He lived through the great period of viol making in England, and we find examples of viols made by John Rose, Henry Jaye, Henry Smith and Richard Meares—among many others—still surviving. Instruments by these makers, made for the nobility who played them in their country houses, were prized by players throughout Europe for a century and more to come. Thomas Mace in 1676 speaks of a ‘chest’ of viols, comprising six viols, two of each size; but the term also refers to an actual item of furniture which contained these viols, their bows, spare strings, rosin, music—in short, all the paraphernalia associated with playing music. In this time Mr John Jenkins began to be famous, and his compositions much sought after. He was once carried to play on the viol before Kings Charles I, which he did in his voluntary way, with wonderful agility, and odd humours, as (for instance) touching the great strings with his thumb, while the rest were employed in another way. And when he had done the King said he did wonders on an inconsiderable instrument. But this gentleman made himself more famous for his compositions of all sorts. There were more consorts of his composing went about among the performers in his time than all the rest of his contemporaries, till he got almost the monopoly of consort music. He lived to a great age, and had composed so much that he knew not half of what he had done. A Spanish Don sent over to the late Sir P. Lely the leaves of one part of a 3 part consort of his, with a desire to procure the rest, costa che costa [at any cost]; for his music had got abroad and was more esteemed there than at home. I showed him the papers, but he could tell nothing of them, when or where they were made, or might be found, only he knew they were his own. Mr Jenkins was a very gentle and well bred gentleman and was always not only welcome, but greatly valued by the families wherever he had taught and convers’t. He was constantly complaisant in everything desired of him, and wherever he went Mirth and Solace (as the song hath it) attended him. After his whole profession was driven from the Court, he past his time mostly in the country at Gentlemen’s houses, and then he composed numerous consorts and in his effete age was no less acceptable, where he chose to reside, than when he was in his vigour, and at last laid his old bones at Kimberly in Norfolk, leaving an old friend a competent legacy to be remembered by. Art and Air come seldom from under a Gown; yet are you not ignorant, how I have appeared taken with what hath proceeded from Mr. Cranford, whom I knew, a sober, plain-looking man: his pieces mixed with Majesty, Gravity, Honey-dew Spirit and Variety. I find less strange from Mr. Jenkins, whose infinite flowing vein, in all kinds I have much admired, as been delighted in: but his Fashion promises no less; Spirit, Garb and Air, shine in his first appearance.